I just want to share with you some exciting make up news going around Manchester at the moment. A new brand is in town and believe me, we are all going crazy about it. 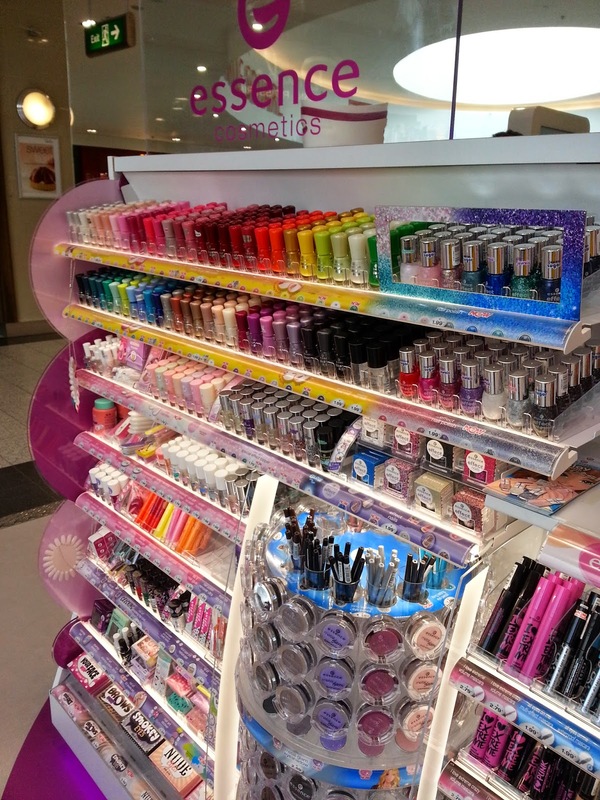 I am glad to introduce you Essence Cosmetics, finally coming from Germany to UK! The lovely Essence Girls I met in the Manchester Arndale. Few weeks ago an entire big pop up shop opened in the heart of the Arndale Shopping Centre where it will remain for one entire year. I went to have a quick look the same morning it opened (I actually took one hour off work!) and I wasn't disappointed. 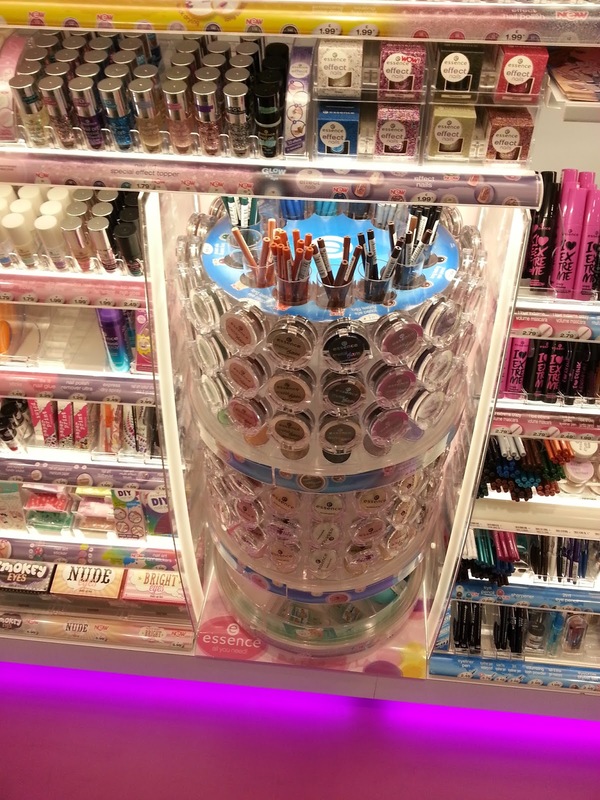 Lipsticks, eyeshadows, nail polishes, mascara, name it, you will find it and, exciting fact, it's cheaper than you think! 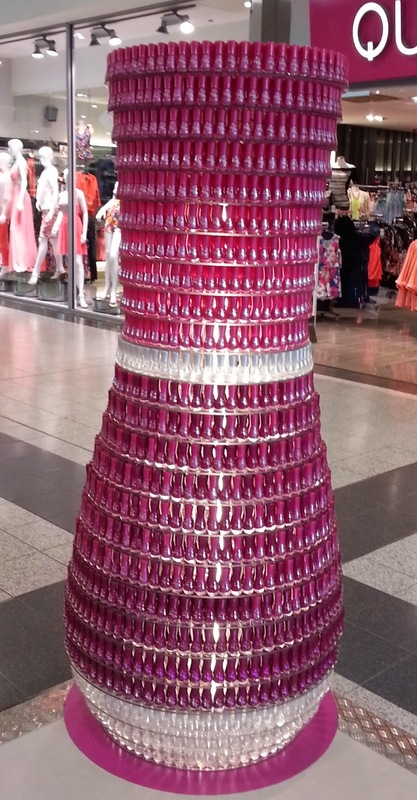 The largest nail polish bottle..made of nail polishes bottle! 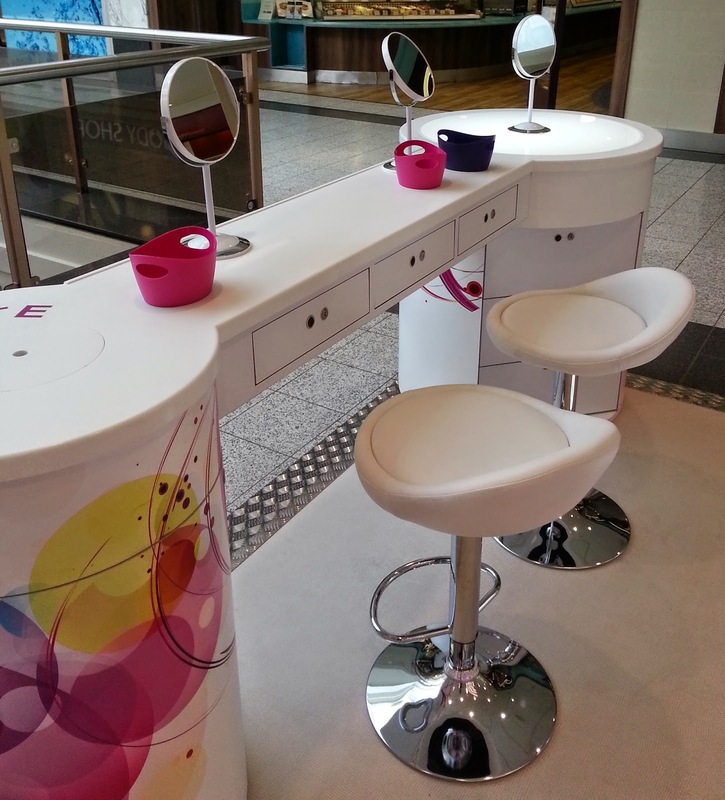 There are some make up table where you can try products and recreate looks you like. These are some pictures of the shop, pretty impressive selection isn't it? 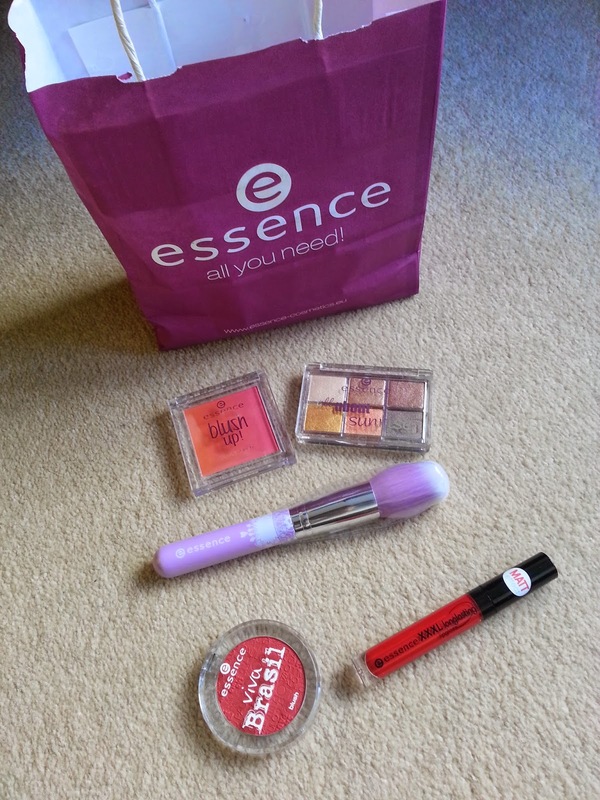 I couldn't resist buying few bits, here is my first (of a long series I am sure) Essence haul. I cannot recall the prices and I have lost the receipt but I can clearly remember the total price for all these stuff was something more than £13. THIRTEEN QUIDS for a brush, two blushes, a lipstick and an eyeshadow palette. If you are not around Manchester or London (where the main shops are) don't worry, Wilkinson will stock the brand nationwide. Yayyyyyyy!!!! The week after these pictures were taken I went to the official Essence bloggers event: stay tuned to find out more! 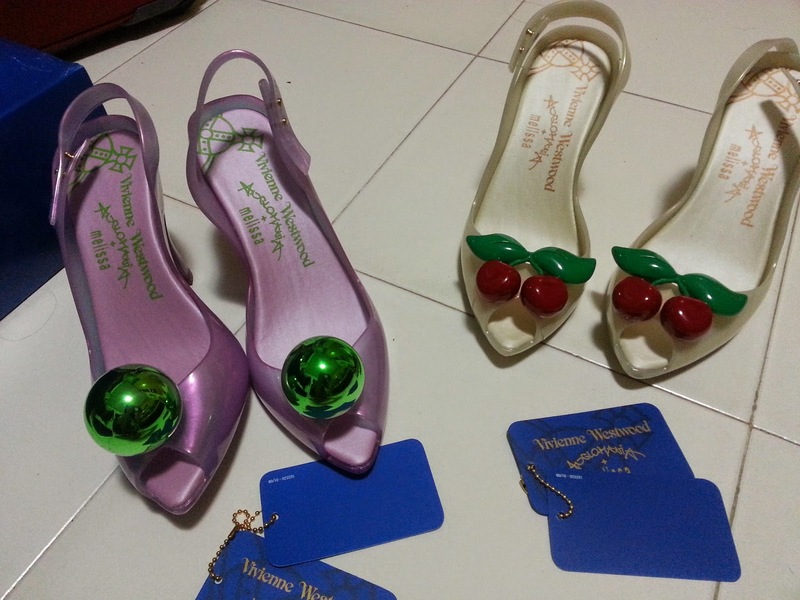 I cannot believe I haven't write a blog post about shoes in such a long time! These are some latest purchases I am very happy to share with you, nothing very posh or big heels this time, but more or less, these are all easy and comfy every day shoes. Let's start from Topshop, where I bought my first pair of skaters. I was patiently waiting for the sale to grab something similar that I saw in Selfridges and in Kurt Geiger, so you can understand my joy when I found these during a very lazy shopping trip in Topshop for a mere £50. 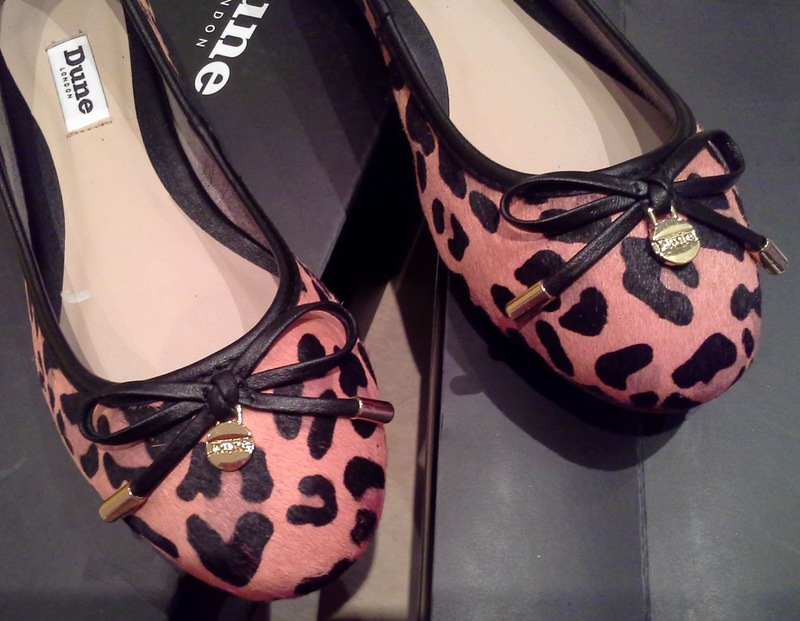 They are the most comfortable shoes ever and my soft spot towards leopard details made the decision to buy these very very easy. I have been looking for a link to the website but unfortunately I cannot find them anywhere, very strange! These ballet shoes were a very easy purchase I made at the latest Laundry Boutique Bloggers event in Manchester (more about that to come): I saw them, I bought them. 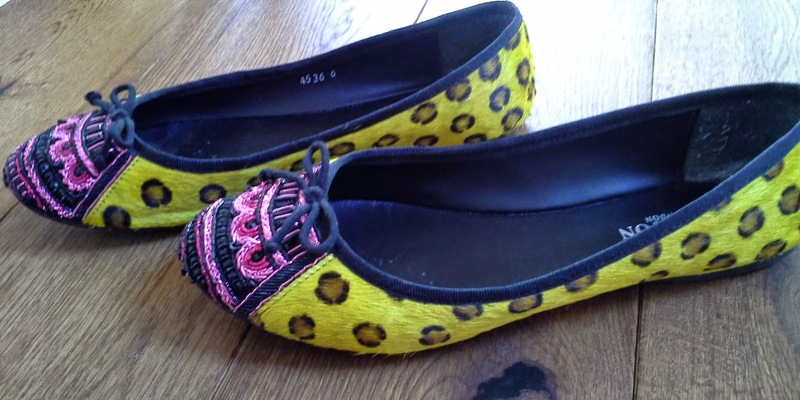 It's again the leopard pony leather detail that made me want these, and the yellow bright colour made just makes these shoes more interesting isn't it? Right, let's move on to the third one and have a guess? It's leopard pony hair all over again and this time is pink! 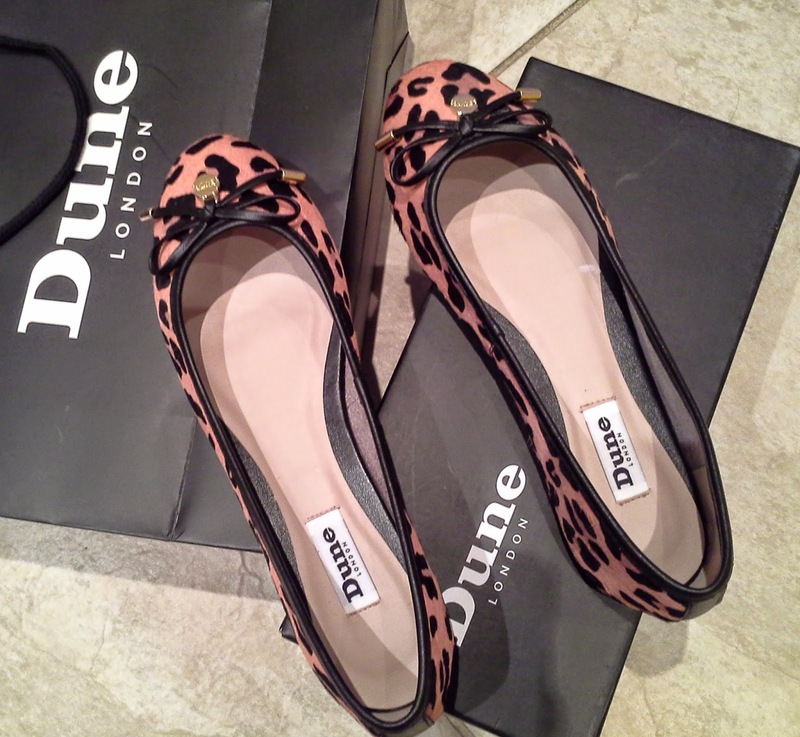 Purchased in Dune on the first day of the sales, I only paid £29 but I cannot find them on the Dune website, I suppose they are sold out but you may be lucky to find some left in store. 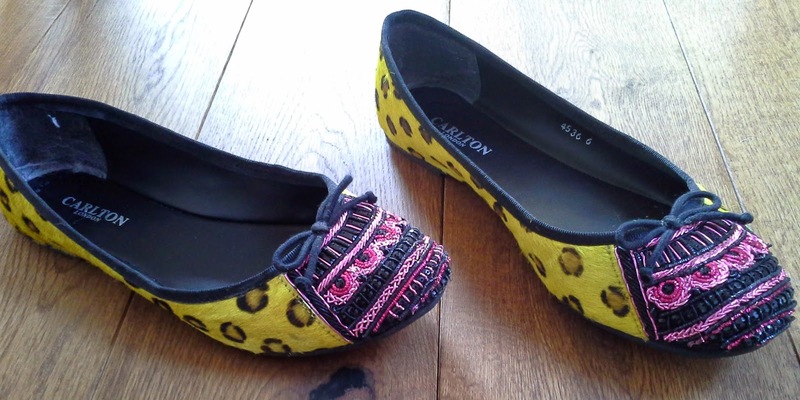 Now, these ballerinas are really something different. It's the quality that stands out, the soft leather inside, the cushioned sole, the leather little bow, it all makes a difference. Shame there were no more colours available, it would have been difficult to resist. 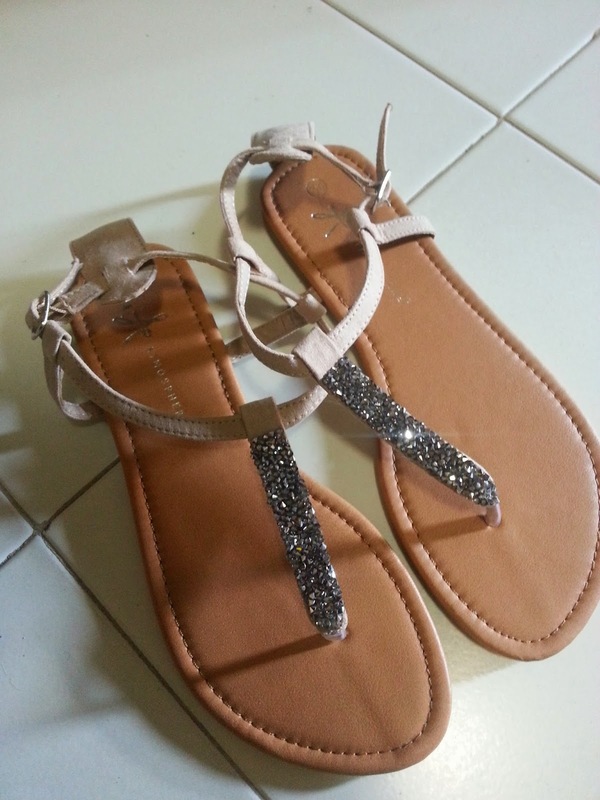 Last but not least, dear old Primark provided an easy solution for my holiday sandals. The crystals are a kind of gunmetal shade, quite original colour really; these are gonna be in my suitcase for my next holiday and probably will be on my feet every single day. I believe I paid around 8 quids for these, there are similar styles for a cheaper price but I wanted a bit of support on the sole and these are a bit better than the usual £5 ones. If you follow me on Instagram you will already know that I found these shoes in Italy last week at the most ridiculous price of £40. I wore the purple ones with a total black look and the white ones with a denim jeans and I had so many compliments, these shoes give personality to any outfit really! Now, whilst browsing the various websites to look for links (that couldn't find, damn it), I bought another pair of shoes: I blame you all for this. 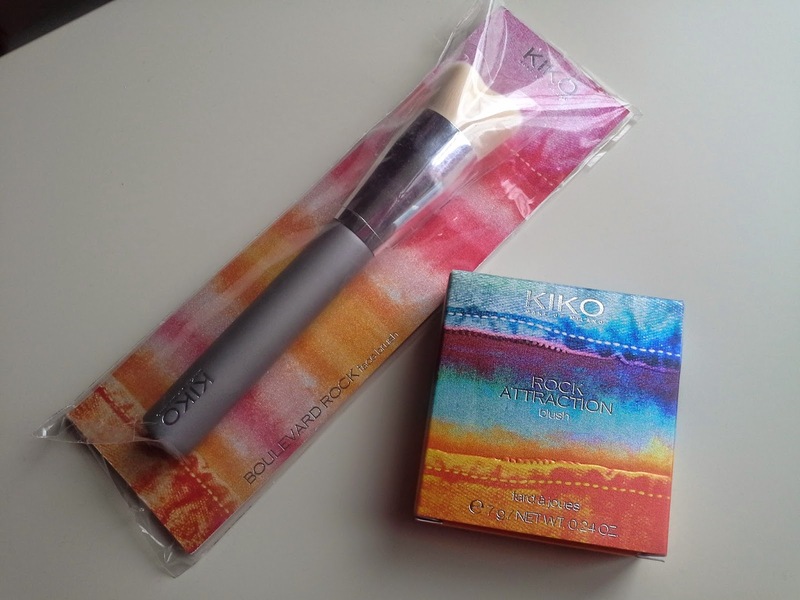 Welcome to another post dedicated to my favourite brand ever, Kiko Make Up. 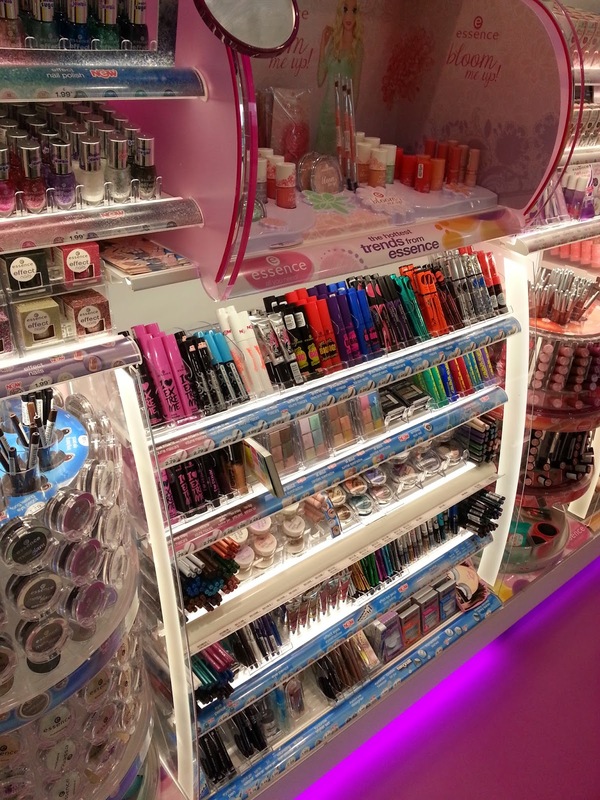 I am tempted to launch an on line petition to beg for a shop in Manchester, what do you think bbloggers? We need, we DESERVE a shop that sells affordable, good quality make up and skincare, constantly launching new collections and products. Today I am gonna show you some bits from the Boulevard Collection that came out few months ago and, drum roll please, is actually on sale. First thing I got is the Face Brush. 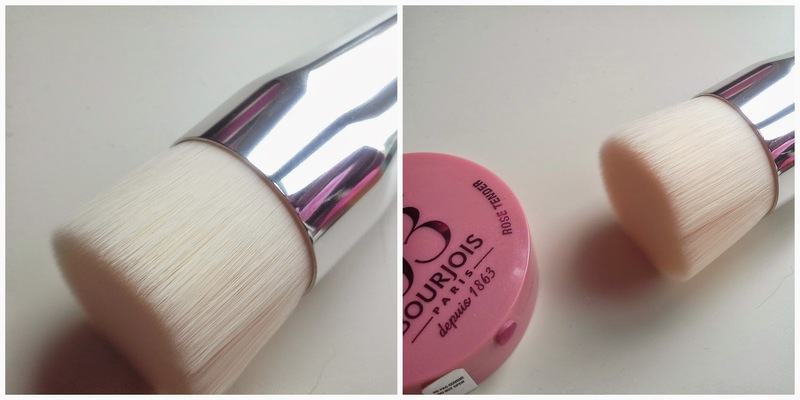 It is described as a brush to use to apply powders. 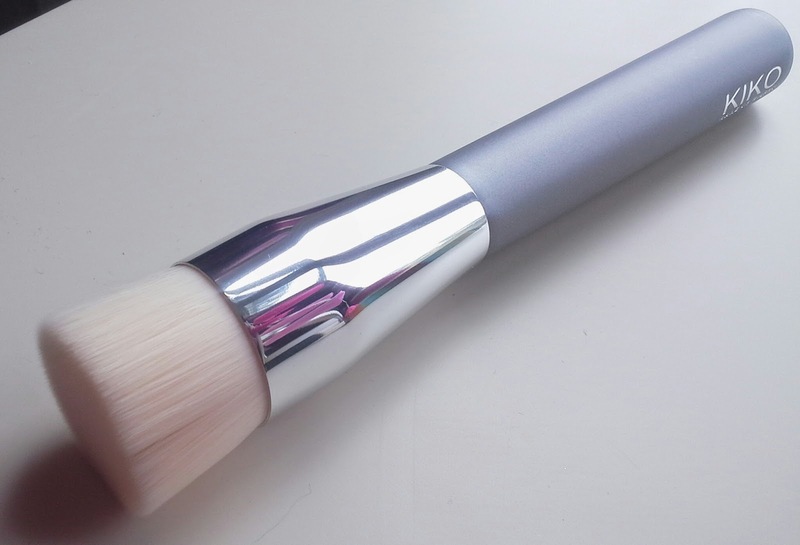 It has got a metal silver solid handle but what you will really notice about this brush is how dense it is. The synthetic bristles are so densely packed that the brush itself is quite thick and compact. I don't own anything similar to this brush. 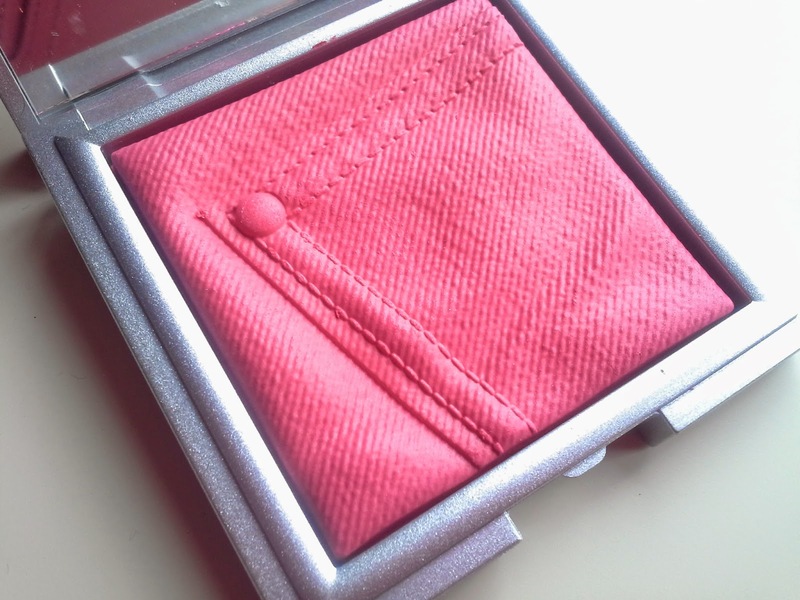 I have been using it to apply blushers and bronzers and despite being so stiff it is not harsh at all. I cheated a bit and I used it to apply liquid foundation and it works well but due to the dense bristle it takes a bit longer to get an even result. It's £11.80 at the moment (was £16.90) and you can find it here. 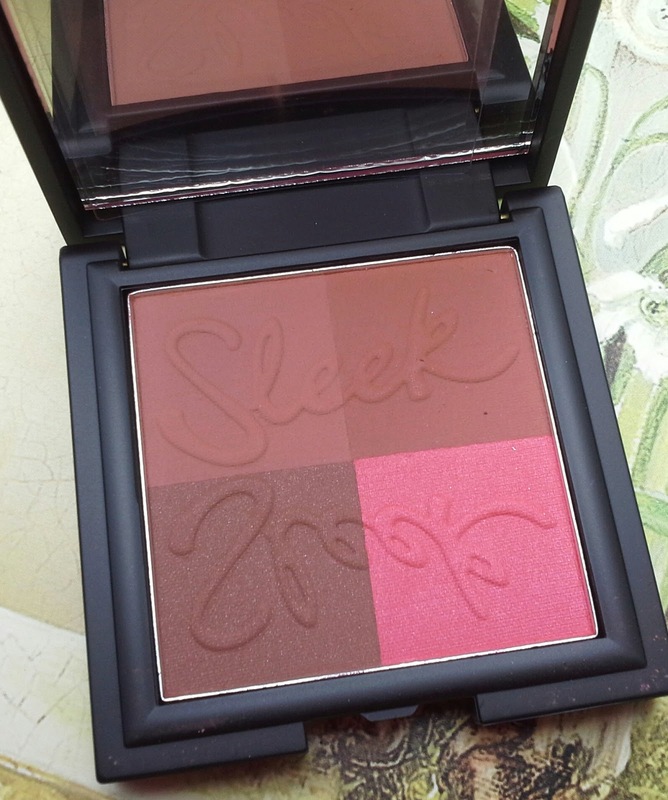 Second thing I got is the Rock Attraction Blush. Available in six shades, I chose number 03, "crossroad pink", a bright shimmer rose/pink. If, like me, you are a sucker for elaborated packaging, well you will love the embossed decor and the sturdy silver case. 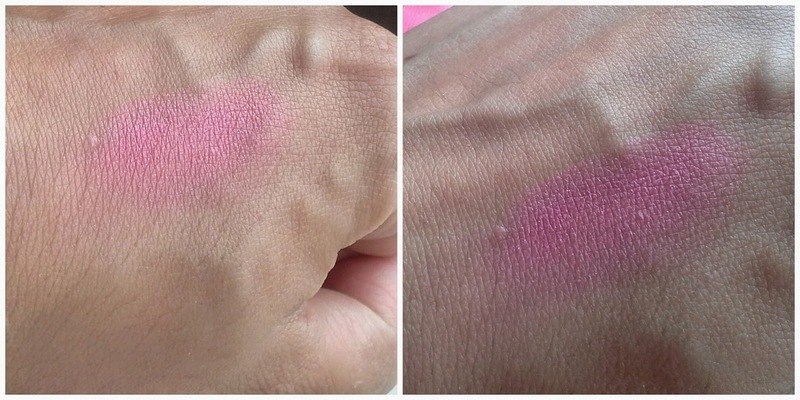 The blush itself is lovely, swatches can show you it's much lighter than how it looks in the pan. 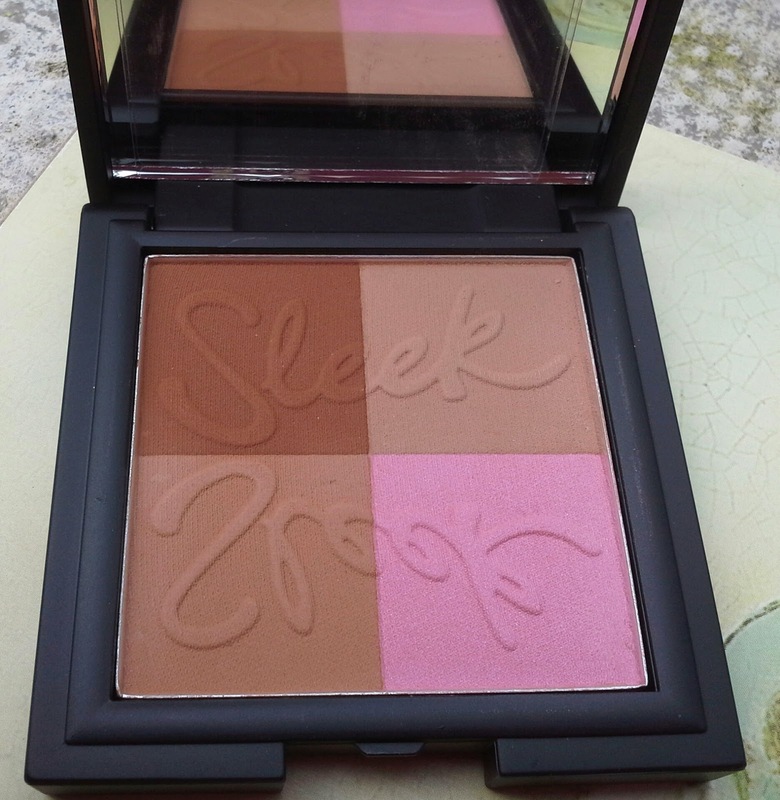 Blends beautifully and gives an instant healthy glow, but sometimes I pack it a bit more for a more dramatic effect. I am waiting to go to the Kiko shop now that I am in Italy to have a look to the other shades. 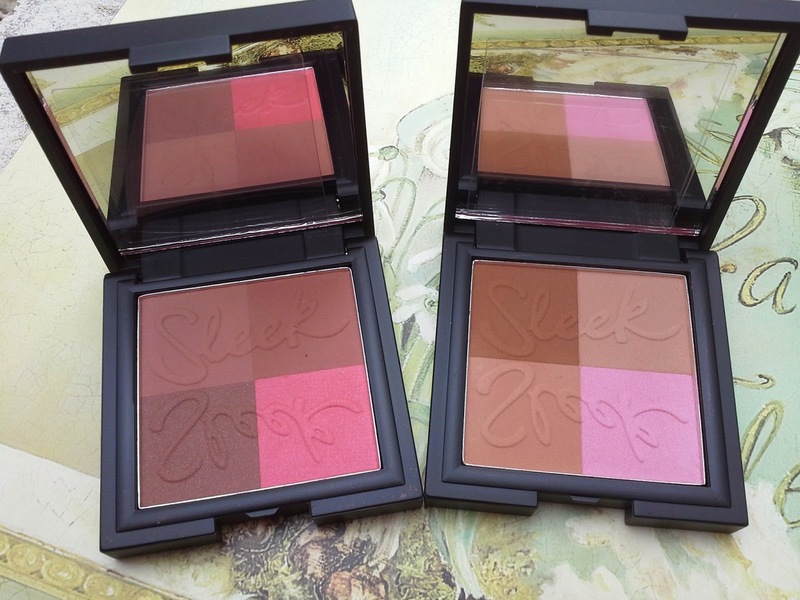 I am tempted by 06 "visionary sienna" that looks a good bronzer/contour powder. 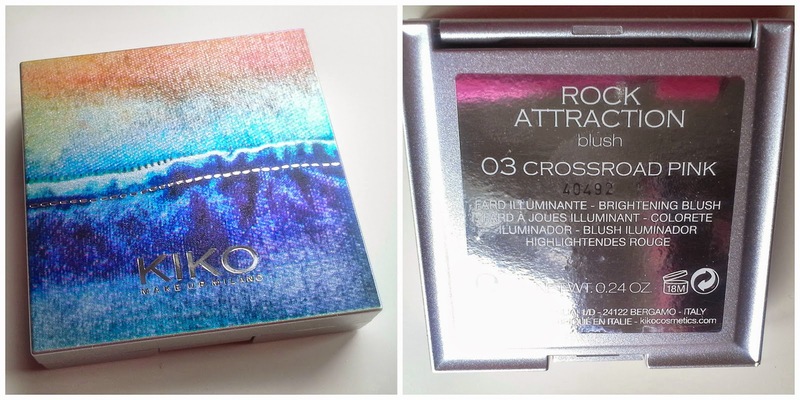 Here is the link to the website if you are not lucky to live in a place that has got a Kiko store, and it's £9 instead of £12.90. Ah, I nearly forgot to mention a very generous promotion I found on the Kiko website, until the 22nd of July, for online orders only, you will get for free one tube of Self Tanning Rapid Drops, normally priced £11.99. It has been a really lovely day here in Italy and finally me, Precious Baby and Perfect Husband got some well deserved relaxing time at the beach. Make up summer collections are all around the shops now and if there is something that can't be missing in your kit is a bronzer. 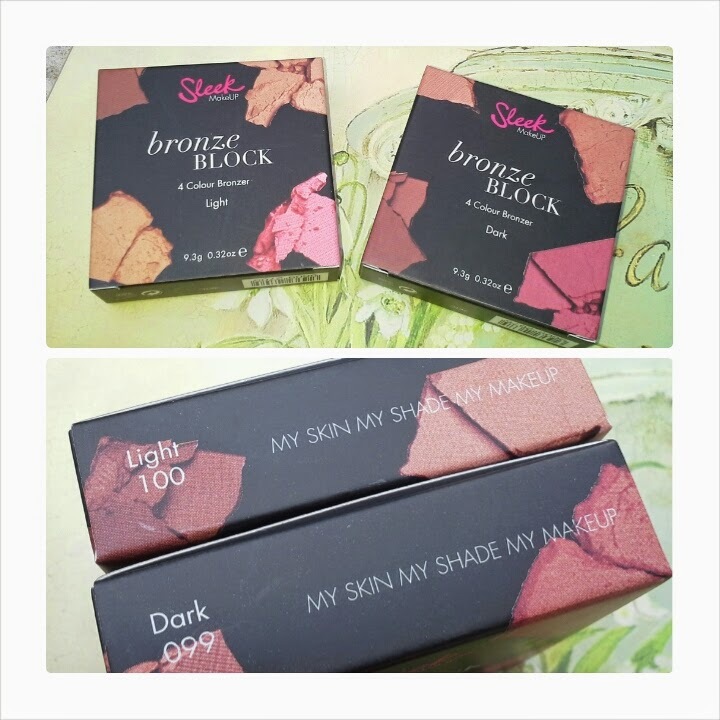 These are the new launches from Sleek Make Up, the Bronze Blocks, available in two shades, 099 dark and 100 light. 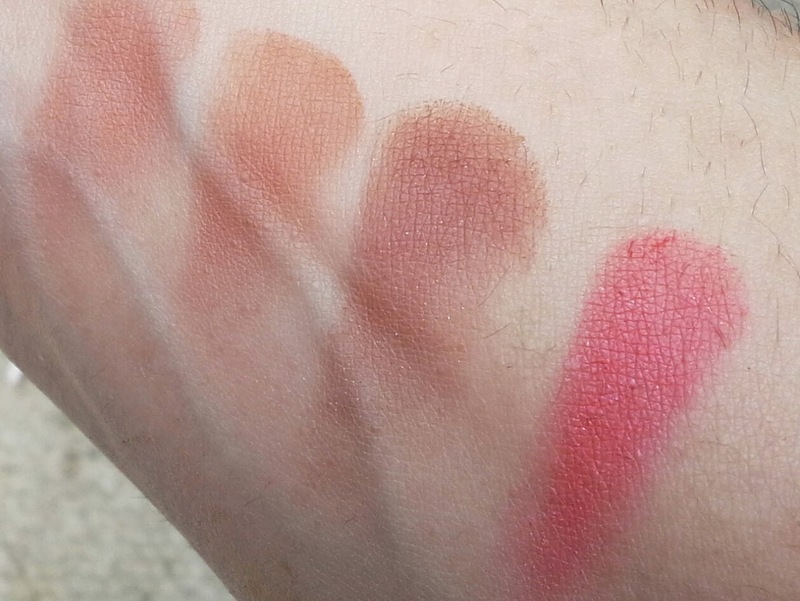 As you can see in the pictures, the bronzer itself is a composition of 4 shades, three different browns and one pink. 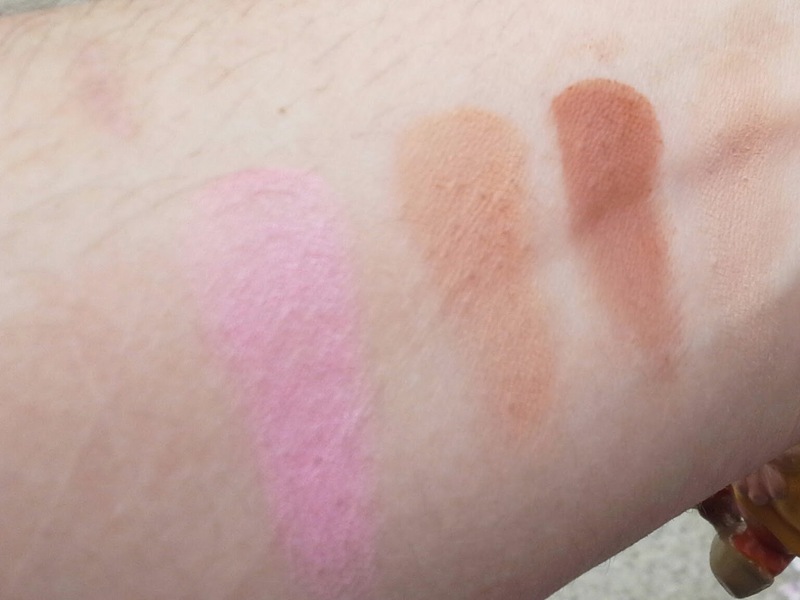 The brown shades are all matte whilst the pink ones, in both the dark and the light options, are shimmer. If I am in a rush I swirl my powder or contour brush (here my fave ones from Lauren Luke) to mix all the colours and the mixture blends very well giving my skin a warm tanned look. For my skin tone (I am mac nc30) the 100 light is maybe too light, it just gives a subtle glow but still very nice. If I want to play a bit more with it, I use a smaller brush (this duo fiber from primark does an excellent job) to pick just one or two shades a do a bit of contouring and highlighting, using the pink shade as blushes at the end. I believe these are limited editions and are not tested on animals. 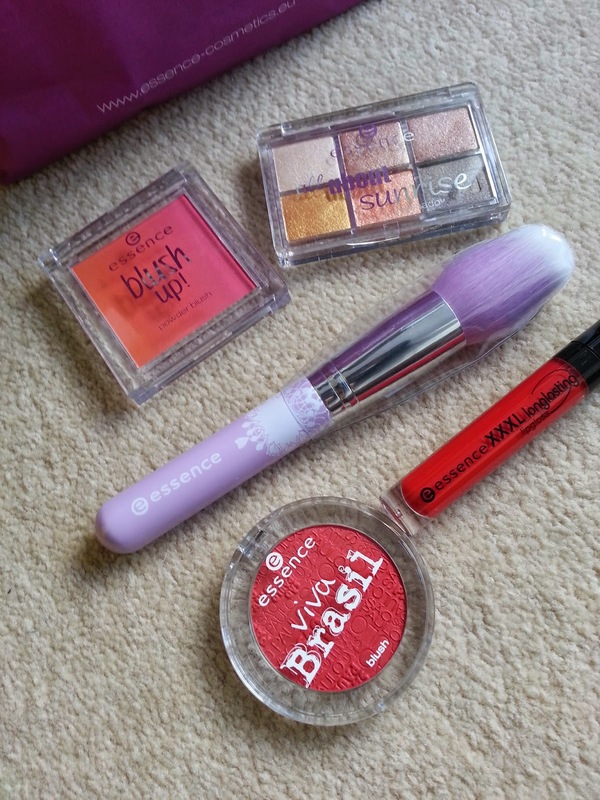 I got mine in Superdrug but you can get them in Boots and online on the Sleek Make Up website priced £7.49. Any bronzer you can andvise for this summer? Do you buy from the charity shops? I always have a look in my local Cancer Research etc shops and I can count some very lucky finds ( oh hello Balenciaga bag). 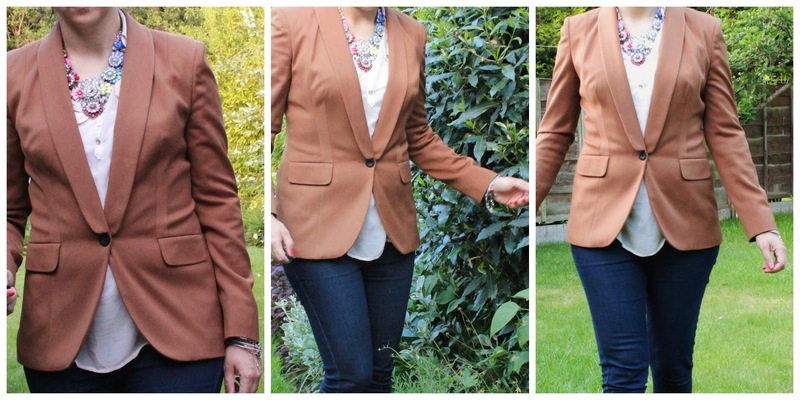 This post is an outfit I wore one week ago featuring one of my latest purchase, this beautiful brown Next blazer, bought for just 4 quids. It's 100% cotton, clean and simple cut, very flattering and perfect for and easy matching with jeans and a plain white shirt. I couldn't avoid add a big statement necklace bought off ebay for about £10, clearly inspired by the Shourouk one seen around so many magazines and celebrities. Jeans are from Primark as the white shirt and shoes are another old ebay bargain. Little close up of my bracelets, these are the ones I am using the most at the moment, it's so easy to pop them in in the morning and they are all presents from special persons (Mum, Sister, Friends and myself of course). Bangles and charms bracelets from Swarovski, heart bracelets from Nomination, lady bird from Thun. I am here, in my dear Italy (I won't mention football and world cup, promise) for a week; I was expecting sun and long days on the beach, I found horrible weather, rain, wind and cloudy sky. I told you this is the year of the lipstick, so here we go, let's talk about another new launch. 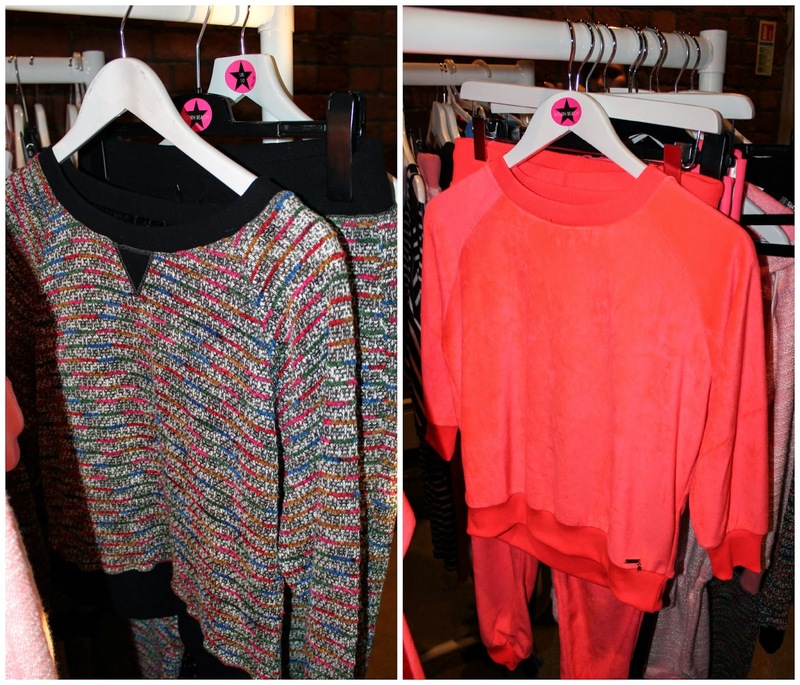 The brand is called "Colour Me Beautiful" and I first had a chance to see some products at an event held by well known Manchester Stylist and Image consultant Susan.
" The Colour Me Beautiful cosmetics range has been carefully designed to suit individual colourings making it easier for you to choose your most flattering make-up shades and create your perfect colour combinations. From your foundation to your lip gloss, creating your perfect make-up looks couldn't be easier "
I was given the chance to try one of the newest shade of the Cream Lipstick and Susan, that clearly knows her job, advised me to try the red hue called "Red Carpet". 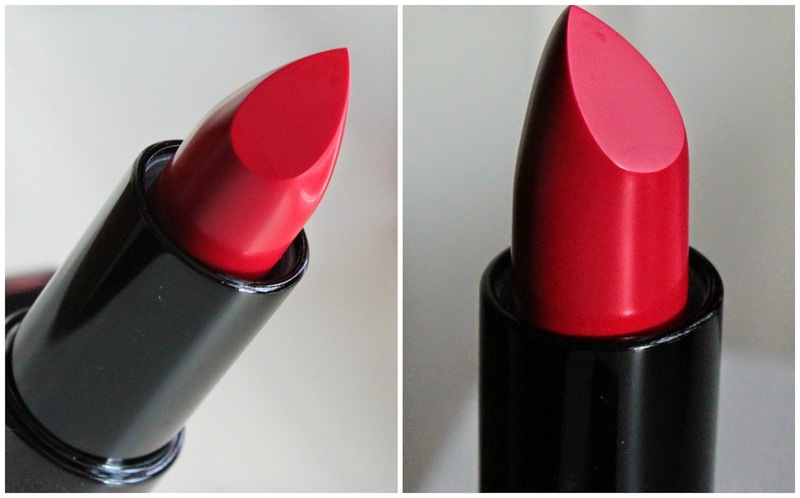 I will keep the review short and simple: I am falling head over heels for this lipstick. It's so creamy, dense, soft, intense, with the most bright and deep red. The bullet is inside a sleek black and posh packaging. 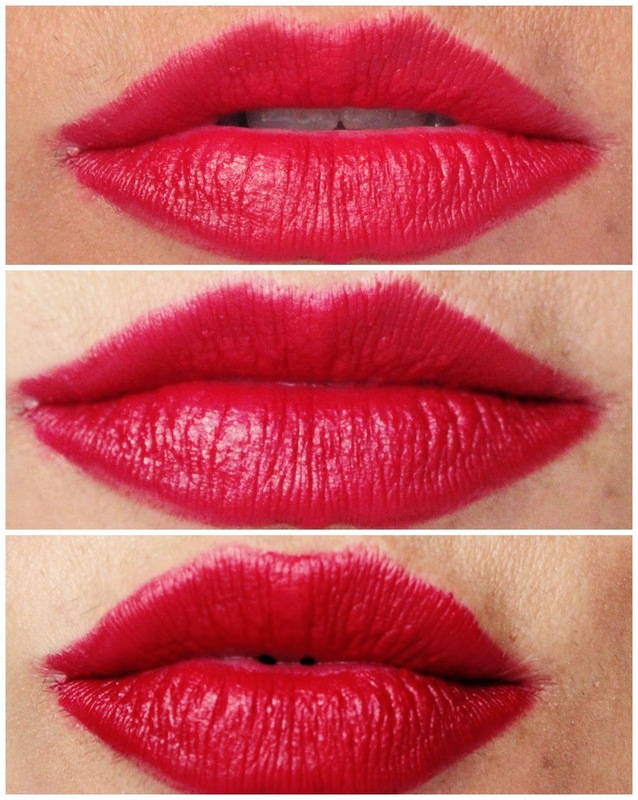 Think Ruby Woo without the dry lips, it only takes one layer to achieve full coverage. It lasts good two three hours without feathering without feeling sticky or too greasy on the lips or, even worse, too dry. It's priced £13.50 and you can get it here where you can see all the 18 shades available on top of foundations, lip glosses and all the range. Hello great people (if you are reading me, you are great!)! Today I wanna share with you some pictures taken at the last South Beach Swimwear bloggers event held a couple of weeks ago here in the sunny (......) Manchester. I will start saying that the only missing thing was a sandy beach; all the rest was there for us, for an amazing summer party! 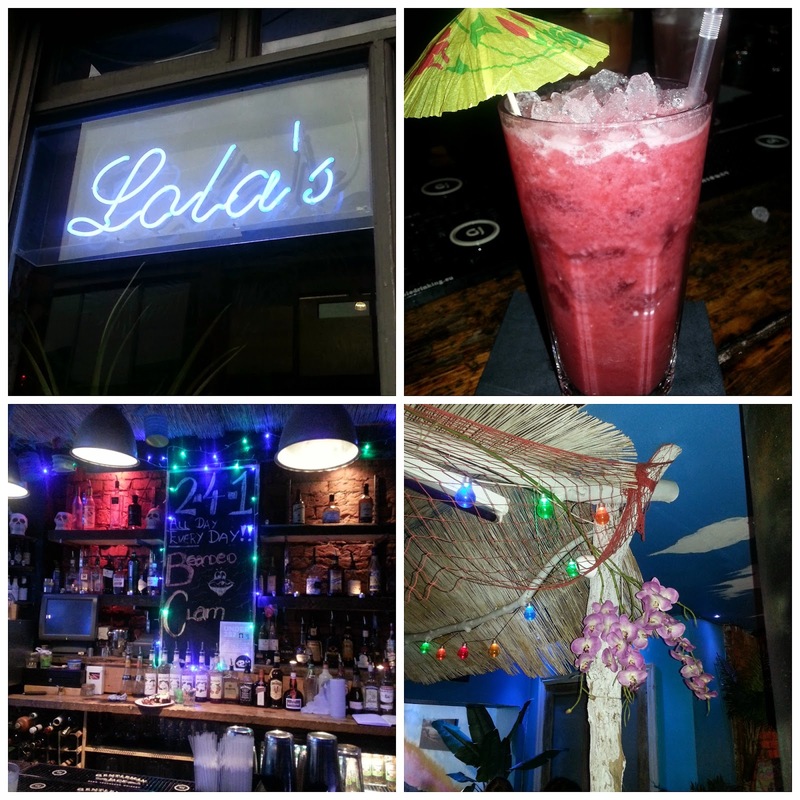 We were invited to the Lola's Cocktail Bar in the Northern Quarter, the perfect place to make us feel like we were on holiday, in a bar on the beach. Flowers, colourful cocktails, bright decorations, is it Manchester or Caribbean Islands? 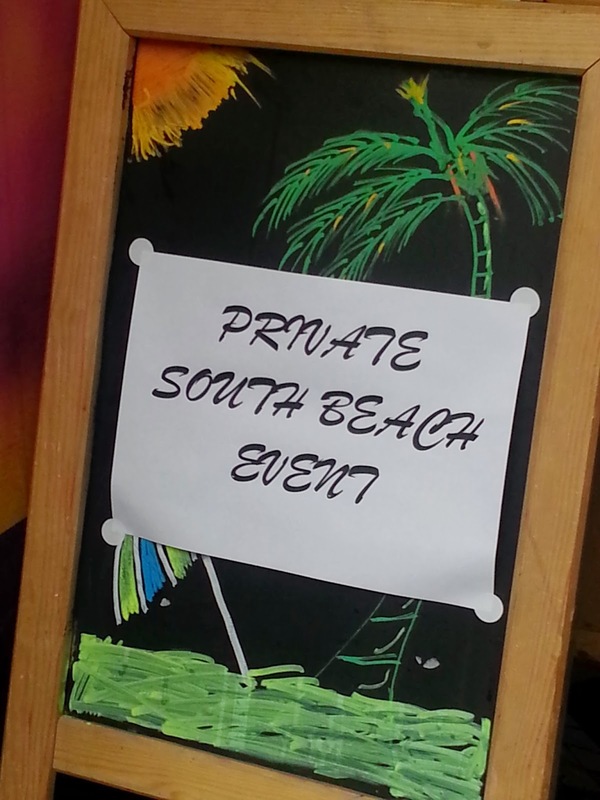 This is the second South Beach event (more on the first one here) I attend and, wow, this people really know how to organise a bloggers party! There was a photo boot with funny accessories to have pictures, games, a manicure service from my FAVE SPA EVER in Manchester, Skin Health Spa, and the most amazing cakes from Home Sweet Home, which is basically the top bakery in the NQ...well probably in all Manchester. Add to all this some cool music, cocktails and all my lovely bloggers friends and here we go, perfect afternoon. I love the South Beach people, they are not pushy or obsessive about their brand, the products and what they can get from you, they were just there with us chatting, laughing and enjoying the party, couldn't really ask for more! But let's talk business: it's June and even if God sometimes forget to move the sun towards this part of the planet, it's summer!!!! Time to start thinking about what to pack and if you are so lucky to go somewhere hot my advice is to have a look to the South Beach website; you don't really want to end up buying the same primark bikini that probably half of the population decided to buy right? You want to be smart, original, cool (...well I want to be slim and tanned and with nice hair but unfortunately South Beach doesn't provide this service..yet). I liked the parrot jewel of the Faye Bird of Paradise top and the embellished Petra halter tops, both in black and white. ...and I totally picture myself wearing this frilly Briony swimsuit with a hat and big sunglasses a la Jackie Onassiss, floating in a pool on a mattress with Adorable dog on my side. The Piper orange geometric print piece made it to my fave ones in my previous post and it's even better in the flesh! Once again I appreciated the comfy and casual loungewear and I was very impressed with the bags, especially this leopard printed yellow number. 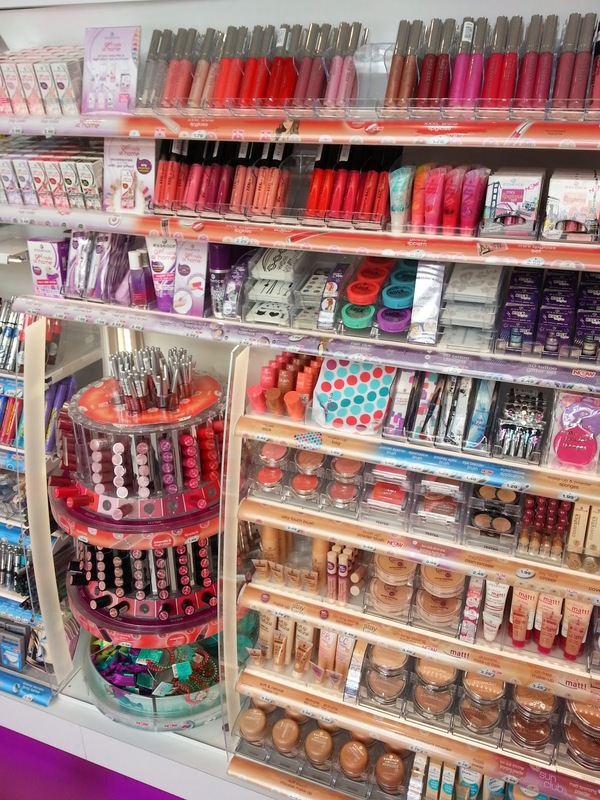 If you have a look to the website, you will find much more, including a beauty section with fake tan and nail polishes from notorious brands. It was a fab night and I really enjoyed it, thank you so much to South Beach for having me and for the amazing goody bag, you guys are the best!